A family man who ran afoul of the Nazis, Josef Jakobs was ill-prepared for an espionage mission to England. Captured by the Home Guard after breaking his ankle, Josef was interrogated at Camp 020, before being prosecuted under the Treachery Act 1940 and executed on 15 August 1941. An open and shut case? MI5's files suggest otherwise. Faced with the threat of a German invasion in 1940/41, MI5 used promises and threats to break enemy agents, extract intelligence and turn some into double agents, challenging the validity of the `voluntary' confessions used to prosecute captured spies. But, more than that - was Josef set up to fail? Was he a sacrifice to test the double-cross system? 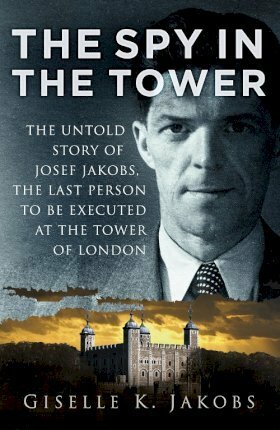 The Spy in the Tower tells the untold story of one of Nazi Germany's failed agents, and calls into question the legitimacy of Britain's wartime espionage trials and the success of its double-cross system. GISELLE K. JAKOBS is the granddaughter of Josef Jakobs. She has a doctorate in palaeontology, which has given her strong research skills that were indispensable in unearthing and tying together the threads of this complex story. A subsequent master's degree in theology and experience as a pastoral associate tempered the scientist with some humanity. Giselle currently works as a facilitator, leading reconciliation workshops between Indigenous and non-Indigenous participants around the Indian Residential School legacy in Canada. The ability to bring opposing views to the table (scientist/theologian, victim/oppressor) has prepared her well to tell the very personal story of her grandfather - a German spy executed by an English firing squad.